As a former administrator of the shrine of Our Lady of Walsingham, Bishop Linsay Urwin is well-placed to speak about Mary and her place in our life and devotion. 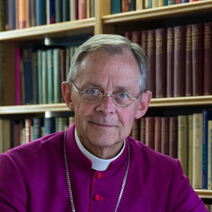 On his departure from Walsingham, The Bishop of Chichester, Dr Martin Warner, Master of the Guardians said: "Bishop Lindsay Urwin has made an outstanding contribution to the life of the Shrine of Our Lady of Walsingham. As Administrator for the past six years he has used the charism of being a bishop to extend the Shrine's outreach. This has deepened its ministry of healing, of nurture of the young, of prayerful attention to the Word of God in Scripture, and of drawing in those who have never known the gospel come alive in the experience of pilgrimage." Bishop Lindsay was formerly the area bishop of Horsham in the Diocese of Chichester in England. He was the Administrator of the Anglican Shrine of Our Lady of Walsingham from 2009 to 2015. He is currently the Vicar of Christ Church, Brunswick.